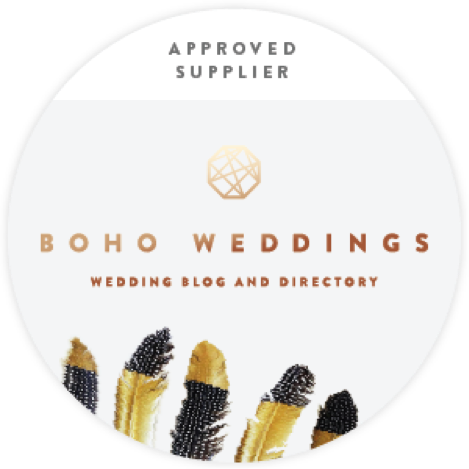 The Royal County of Berkshire - home to Windsor Castle, the recent host of the Royal wedding between Prince Harry and Meghan Markle. 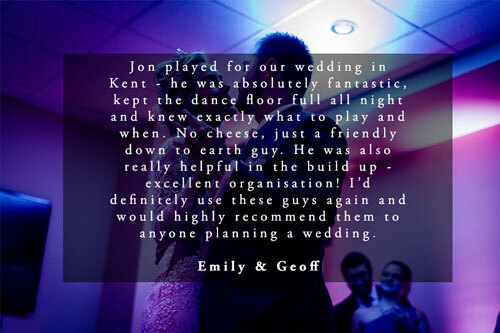 The spotlight brought by such prestigious nuptials has helped transform Windsor - and in turn Berkshire - into one of the hottest wedding destinations in the UK, if not the world. 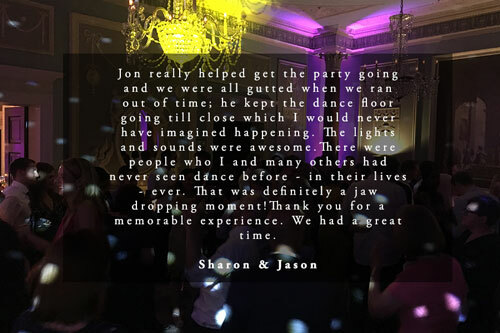 But you don’t need to get married in Windsor Castle to find yourself an amazing venue within the county. 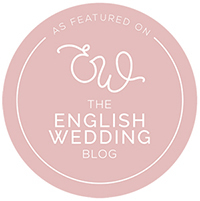 There’s a plethora of great destinations in places such as Henley-on-Thames, Royal Ascot and the quaint village of Buckleberry (which also has a Royal connection – it was where Kate Middleton grew up). 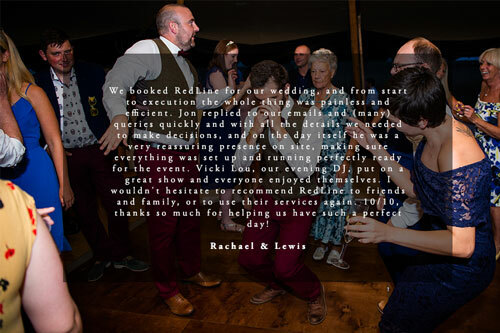 It doesn’t matter what venue you choose, whether opulent, rustic, intimate or anything in between, we know that there is one thing that every wedding couple has in common; the desire to throw the perfect wedding day celebration. 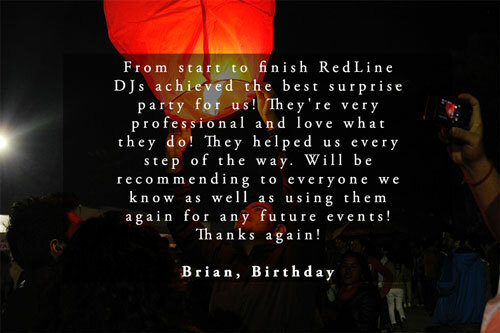 And that is where we come in. 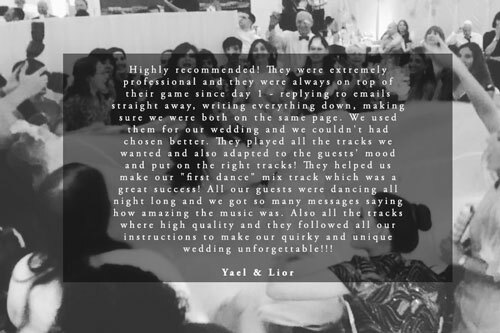 We believe that one of the most important factors in throwing the perfect wedding, is getting the music at your reception spot on – after all, it’s the last thing people hear before they go home and often what sticks in the memory the longest. 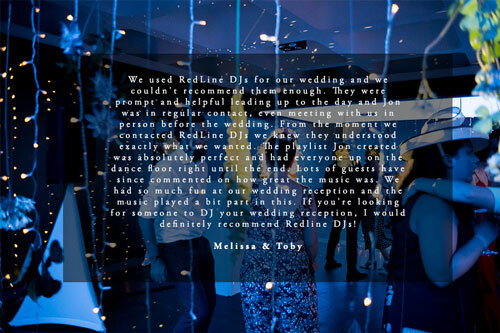 At RedLine we believe that the very best weddings are a perfect reflection of the two people getting married so we work with you to make sure that we only play the music that you and your partner want to hear on your wedding day. 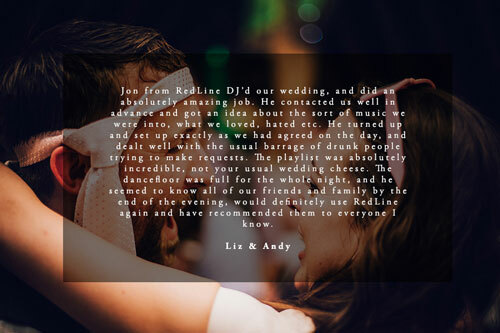 Depending on the kind of music you’d like, we will select the right DJ for you from our diverse roster and put together a bespoke, personalised playlist, just for you . 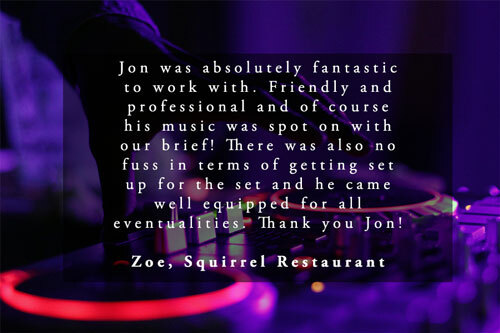 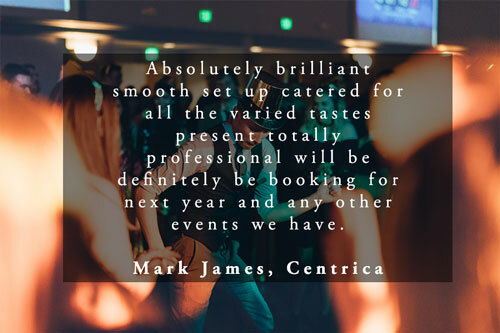 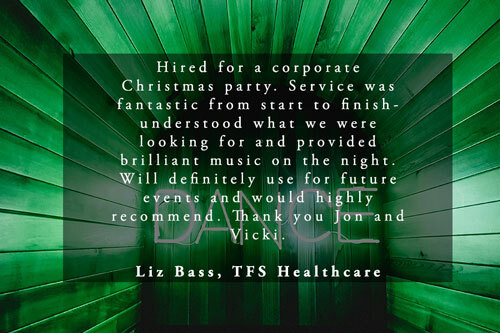 We hand select some of the very best DJs around, with experience at a multitude of different venues both in the UK and further afield we are confident that we will find the right DJ for you. 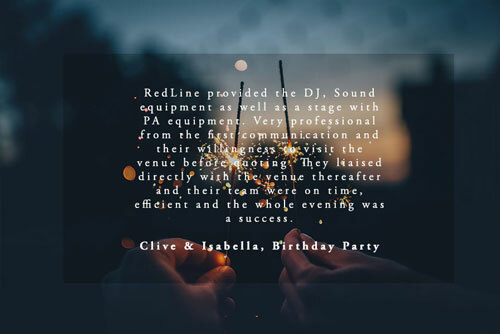 We also know know that for a lot of couples, the way the DJ looks is an important consideration and so we make sure to only use the very best equipment and keep our setup as compact and discreet as possible. 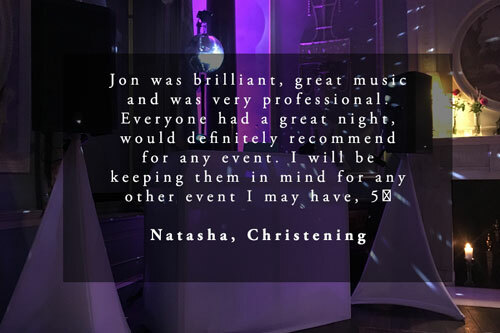 All of our wedding DJ packages come with intelligent ‘moving head’ lighting and DJ booth as standard and we are more than happy to discuss any specific lighting needs with you, as required. 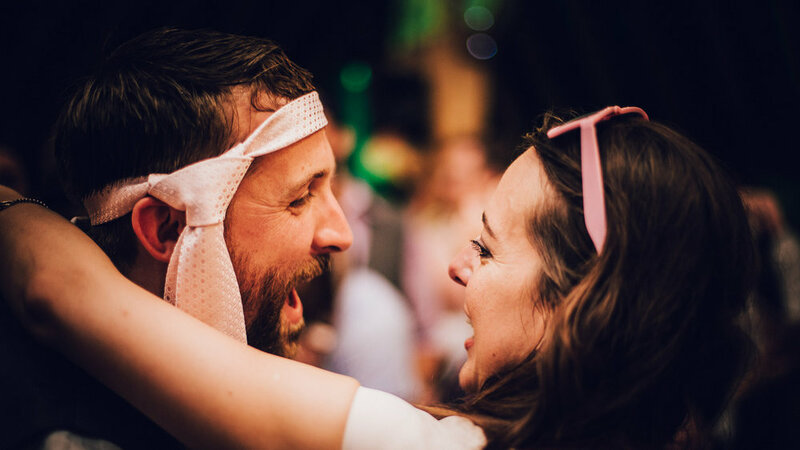 If you’d like an I ♥ 80s style clubnight for your wedding reception, we can make that happen. 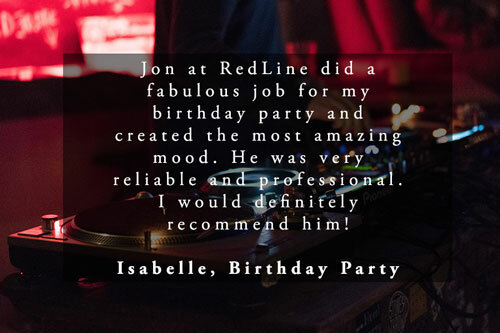 If you and your partner would like to have a night dedicated to David Bowie or Prince we can do that too (we’ll even bring a wig or two). 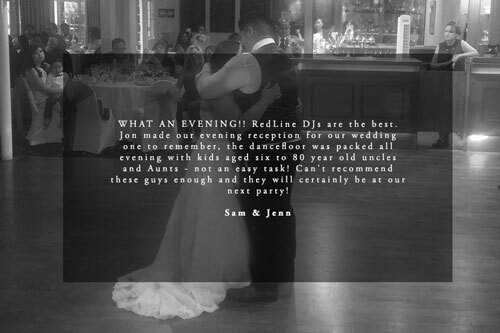 If you would like a night that covers a multitude of genres to cater for the many age groups in attendance, then we will put a set together to reflect this (and do it without resorting to the same old tired, cheesy tunes). 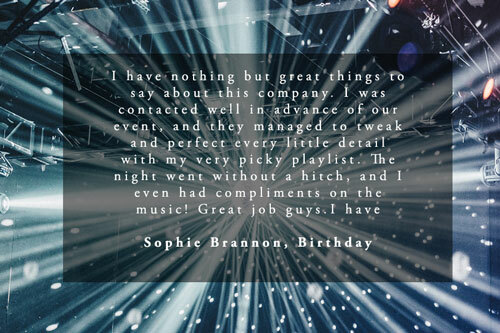 Whatever you want to hear, let us know and we will make your musical wishes a reality. 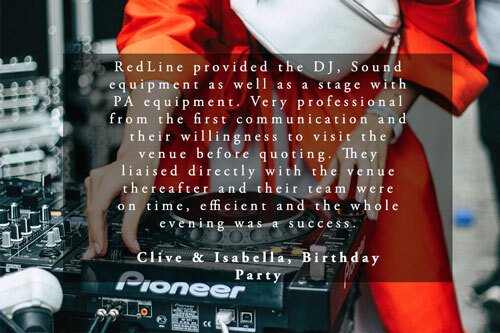 RedLine was created because we were tired of going to weddings where the music was curated and played by out of touch and arrogant DJs that hadn’t moved on since the 90s. 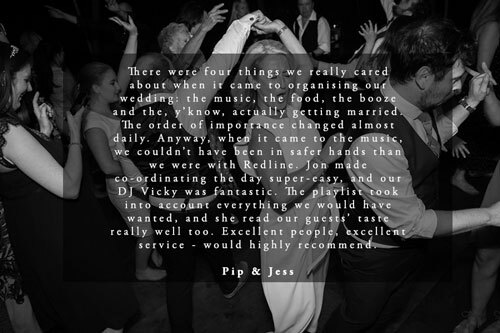 It seemed to be the case that almost every wedding we went to played exactly the same songs; The Grease Medley, The Macarena, the Cha Cha Slide… *shiver* No-one appeared to be having a good time and each wedding seemed to merge into the next. 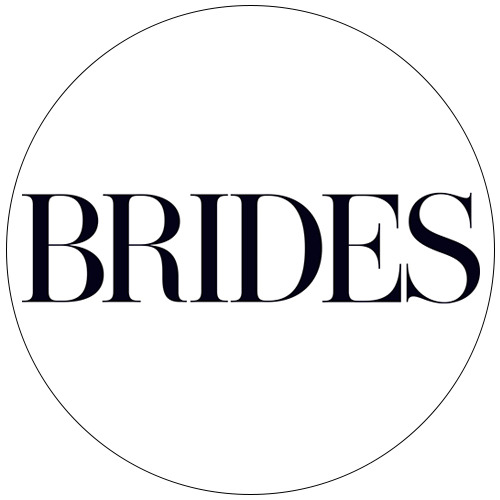 So we decided to do something about it. 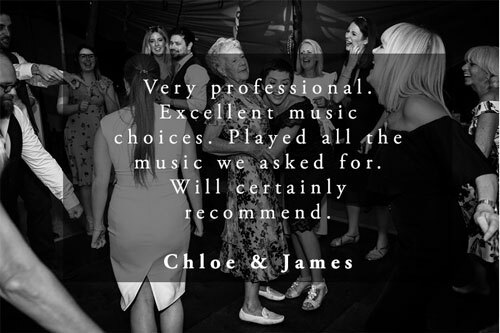 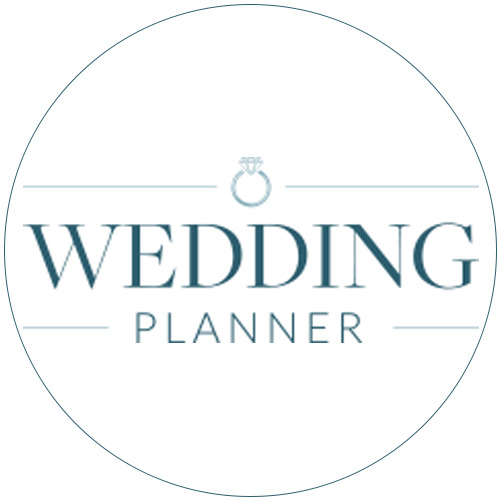 Our strongly held belief is that every single wedding should be different and that all couples should get the chance to put their own spin on their music and in turn, enjoy a night of dancing with their family and close friends. 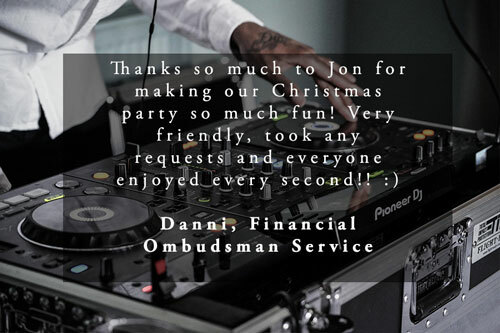 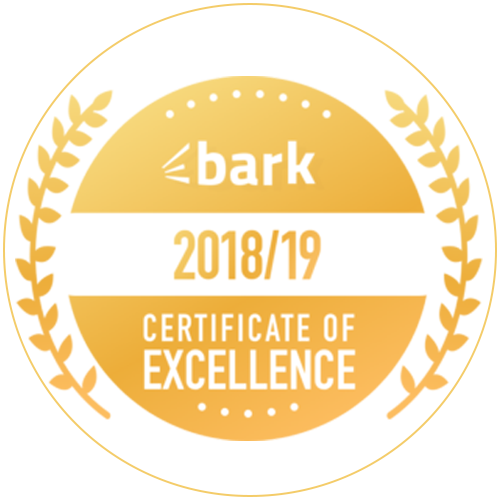 contact us for a no-obligation quote today! 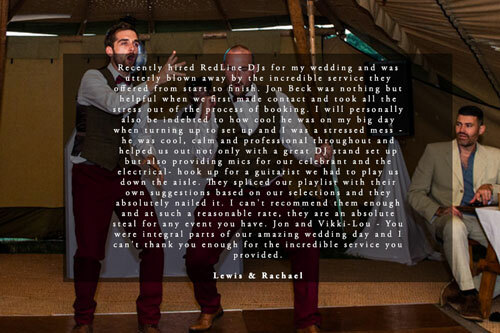 DJs available in London / Surrey / Sussex / Essex / Middlesex / Buckinghamshire / Kent / Hertfordshire / Berkshire …and beyond!